Portable dehumidifiers are the most common and effective way to dehumidify a contained room or centralized space. During the summer, the ideal humidity level for a home is somewhere between 30% - 50%. Any level higher than that can cause mold, mildew, and bacteria growth in addition to harmful effects to your home such as warping your wooden floors and furniture. 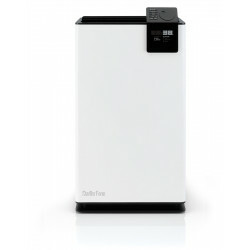 Popular models are: Aprilaire 1850F Dehumidifier and Stadler Form Albert Dehumidifier .